Welcome to Fish Window Cleaning Kissimmee and St. Cloud, FL! We are your locally owned and operated professional window cleaning company and we're ready to make your home or business shine all year long! We serve the south Orlando area, including Kissimmee, St. Cloud, Lake Nona, Meadow Woods, Hunters Creek, Narcoossee, Celebration, and Poinciana, FL. Thank you for your interest in Fish Window Cleaning of Kissimmee and St. Cloud! We know that you want a professional, reliable window cleaning company and with FISH, that's exactly what you'll get! You can trust us to keep your home or business sparkling all year long. Our estimates are always free so give us a call today! We know that you have a to-do list a mile long and window cleaning is probably not at the top of that list. While it is often put off because it's so time consuming and can even be dangerous, it's a very important part of keeping your house looking its best! Let us handle the hard work for you and make all of the windows in your home sparkle! We respect your home by wearing clean shoe covers and using absorbent cloth pads under your windows to protect your carpet and wood floors. Our cleaning products are environmentally-friendly so you and your family are not subjected to harsh fumes. We even introduce you to our friendly, professional team so you know exactly who is making your windows shine! Your windows are the first thing your customers will see so let us help give them a great first impression. As business owners, we understand that the needs of other business owners vary. 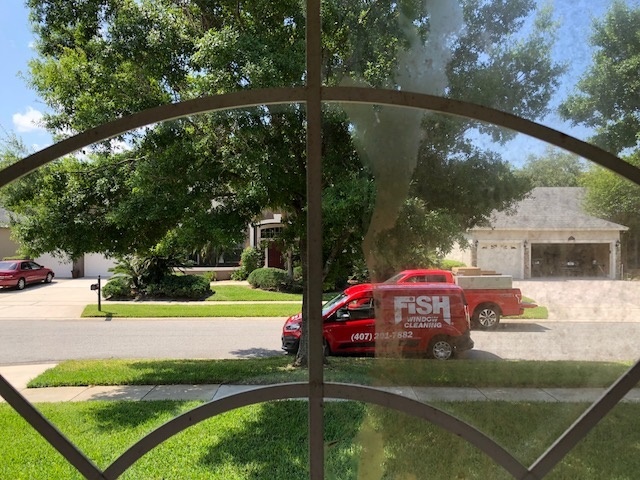 Fish Window Cleaning has been in business since 1978 and we realize how important it is to tailor our services to meet your specific needs, budget, and schedule. Whether your business is a restaurant, a church, an office building, or a store, we can make all of your windows sparkle. We also know that our appearance reflects on you. That's why our window cleaners are uniformed and professional. Our team is bonded and insured so there's nothing to worry about when you hire Fish Window Cleaning! "I have had bad experiences at other companies whose window cleaners never showed up when they were supposed to. FISH is always here on time and does a terrific job."